On Taste, Price, and Value! We think these are the best overall wine of the month clubs, not just those that rated the best. These are the 22 5-star and 4.5 star wine subscriptions we've reviewed. 62 wine subscriptions didn't make the list! Looking for a wine club subscription? We taste wine from nearly every wine club we review and rate the clubs objectively. Satisfaction guarantees, wine quality, convenience, discounts, and several other factors help us determine the best wine of the month clubs. Looking for a cut above the regular wine selection in your next monthly club? Try one of these Premium wine clubs. The wines typically cost a little more, but you’ll find you have access to a more unique selection, and wines that are much harder to find at your local store or in another wine club. The subscription box trend is about more than getting your goods by mail. Personalization, Online Management, and Flexibility are key to a good subscription service. These are our top picks. It's not exactly a wine club, but it's among the very best wine buying services we've seen. They have hundreds of wines to choose from and you get steeply discounted rates for becoming a NakedWines.com Angel. Read our NakedWines.com Review. We like the modern-day négociant business model for wine clubs. They scour the Earth to find great deals and sell the wine at affordable prices. Plus, we like their selection! Read our 90+ Cellars Wine Review. Personalized wine clubs are proliferating, as are wine clubs priced at $15 a bottle and under. This one is worth checking out. Read our Firstleaf Review. Macy's (the retail department store chain) has joined the wine club fervor. You can now sign up to receive quarterly wine shipments at an affordable price from Macy's, too. Read our Macy's Wine Club Review. Anyone who's a fan of Martha Stewart will appreciate that she tastes and approves every wine that gets shipped out from her namesake wine club. Anyone else looking for an inexpensive monthly wine club ought to be pleased, too. Read our Martha Stewart Wine Club Review. New to wine clubs? Start here! What makes a great wine club? What makes an affordable wine club great? Just what do we mean by "value?" What makes a great red wine club? Great red wine under $30? What makes a great wine club gift? The excitement of a monthly wine delivery, elaborate newsletters with recipes for food pairings and educational articles, and boutique wines will delight any wine drinker. Wine of the month clubs make excellent gifts for any type of wine drinker. Say Thank You or Congratulations or Happy Birthday! Wine basket gifts come with snacks and special bottles of wine to show how much you care. We've hand-picked the best ones for you. 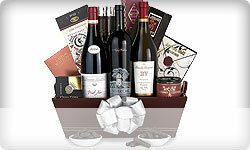 Wine basket gifts are a great way to help celebrate any occasion. If you're buying a gift for a wine lover we highly recommend exploring wine gift sets. These hand-picked sets come with 2-4 bottles, in unusual packaging, with high-end accessories, or just really great wines. Wine gift sets are the ideal gifts for the wine enthusiasts in your life. If you live in one of the alcohol-friendly states, it probably never occurred to you that we have some arcane shipping laws in this country when it comes to alcohol. This makes purchasing a wine club as a gift, or even for yourself, just a teeny bit more challenging. 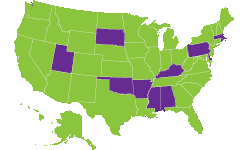 FedEx will ship wine clubs to the green states in the map, IF the wine club has a license to do so in that state. Those purple states are mostly off limits to FedEx, but other shippers might be able to send wine to them. See how this gets complicated quickly? But never fear! WineClubReviews is here! We've organized the wine clubs we've reviewed into handy "ship to state" pages, so you can send your wine to Maryland, Pennsylvania, and even Utah (well, maybe not Utah). There are certain features any good wine of the month club should have: a satisfaction guarantee, excellent delivery management and customer service, some degree of personalization, and the pricing should never exceed full retail (what you would pay at most local wine shops). A great wine club goes above and beyond, offering extras that make the wine subscription experience superior to buying wine locally, unless you're a major wine geek who likes shopping for wine for the fun of it. The definition of affordable is subjective — as is the definition of good wine for that matter — but our list of affordable wine clubs focuses on folks with a wine budget of less than $15 per delivered bottle. That list is not specifically about value. If value is key, and not specifically a low price per bottle, please see our list of best wine club values or skip to a description of value. When you choose an "affordable" wine club, you might be giving up on certain wine subscription perks, like an excellent customer service team or a top-tier satisfaction guarantee. Also, in this price range it's reasonable to expect average and only sometimes above-average wines. Our wine subscription reviews below should steer you toward the right selection for your budget. Insider Tip: The best prices on wine bottles in subscriptions are typically reserved for volume purchases. We strongly recommend ordering shipments of 12 bottles and have them delivered every other month or quarterly if you drink less than 3 bottles a week. You'll save on shipping and earn volume discounts. When thinking about wine subscription value, we're looking for more than just getting decent wine delivered. We expect a satisfaction guarantee, a high quality of wine, and excellent pricing for that wine. Do you know where we find this great value? In smaller wine clubs… the kind you probably have not seen ads for on TV, received a coupon voucher for in the mail, or found on Groupon — we usually classify those wine clubs as "affordable," not "value." The best value typically comes from smaller wine clubs, run by small teams of wine lovers and true professionals who usually, in turn, work with terrific smaller wineries around the world. These wineries often have trouble getting good distribution because their production is too low to catch the attention of the booze czars that make gobs of money peddling critically-reviled bulk wine. Note: None of the wine clubs on our value list offer "bulk wine," though you may sometimes find purveyors of "bulk wine" on our list of best affordable wine clubs because that's part of how they get the prices so low. If you prefer something between affordability and value, it's easy to stretch your dollar on high-value wine clubs. Look carefully at the pricing structure of the club you want. Many wine clubs give you better prices when you commit to a higher volume. This could be when you buy 12-bottle shipments (which also reduces your shipping cost per bottle significantly) or if you buy on a pre-paid basis for six months or longer (sometimes we call that a "gift" for yourself). We've reviewed dozens of red wine clubs. Whether they feature only red wine like Pinot Noir or Cabernet Sauvignon, just French or California reds, or only red blends, there are a gazillion red wine clubs to choose from and they're available at a host of different prices. It's easy to get overwhelmed, but the great news is, we've got your back. When wine starts to get a bit more expensive, we think buying through a wine club is superior to buying in a store — particularly if you know what you like or open to many grapes and regions — because of the satisfaction guarantee offered by so many clubs. The best wine clubs will replace anything you don't like, including the expensive stuff. You'll also typically get access to wines you won't find in a store because of smaller productions and winery-direct relationships that bypass the conglomerate distributors. Our list of best red wine clubs focuses on truly the best red wine available through online wine clubs. We didn't use price as a limiting factor because we think the best red wines show up in many different price ranges and we wanted to highlight wine clubs that consistently ship out terrific red wine. Wine connoisseurs and enthusiasts who frequently spend upwards of $40 on a bottle of red wine. This list of red wine clubs is for you. We've picked out the wine of the month clubs which send the very best red wines on the market (short of cult wines, of course). Soon-to-be connoisseurs and enthusiasts who typically spend up to $30 a bottle — for you, we recommend our best red wine clubs under $30 a bottle list. This category is especially useful because these wine clubs got on the list by providing exceptional value. Everyday wine drinkers looking for a red wine club at less than $15 per bottle — for you, we recommend checking out our best affordable wine clubs. Every wine club on that list is available as a red-only wine club. Be sure to read our reviews carefully to make sure these clubs are a good fit for your preferences. Gift-givers, please look at our best red wine clubs for gifts list. Something to note: if you're looking for a wine club featuring a particular region, you should prioritize searching for that region instead of "red wine club" because most wine clubs are available with a red wine only option. We currently have options for California, Italy, a generalized International, as well as Pacific Northwest. Likewise, there are several Pinot Noir, Cabernet, and high-end wine clubs that are worth your attention. Great red wine under $30 a bottle? We've reviewed dozens of red wine clubs at every price point and in every style. Wine clubs that specialize in wine under $20 per bottle rarely deliver great red wines, or even really good ones. The reasons for this aren't mysterious — red wine costs more to begin with, it's hard to make a really good red wine which retails for less than $18, and packaging wines for shipping costs money. Nonetheless, some wine of the month clubs have figured out that you can have a great red wine club which keeps the per bottle price under $30. That's what our best red wine clubs under $30 a bottle list is all about — helping you find the wine clubs that focus on getting great deals on wines and selling them on the cheap, and other wine clubs which are astute importers finding great wines in undervalued markets (like Spain, Portugal, and South Africa). Most important: Giftworthiness. Are you sending it to arrive on a particular date? Do you want to mail or give a custom printed note? Do you want special gift packaging (usually free)? We highlight special gifting features of each wine club in the text below. Important: Wine Education. A significant part of the presentation and experience in a gift, it's less important in a regular wine club where the information can be presented digitally or in a less "shiny" format. Less Important: Wine Quality & Satisfaction Guarantee. While we don't you want sending swill to your beloveds, we also know of no one who complains about free wine, even if it's not that great. 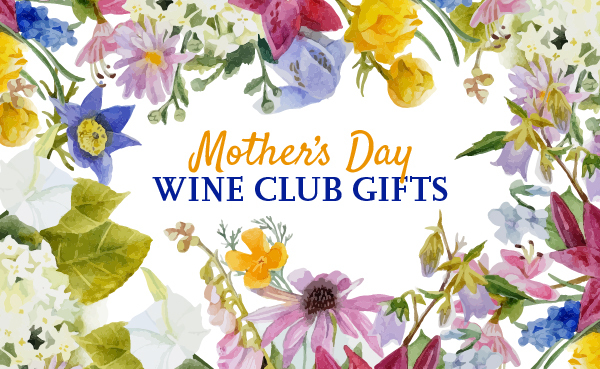 We only put wine clubs on this list that have consistently good quality wine but we don't put much emphasis on the Satisfaction Guarantee in a gift (like we do on every other kind of list we assemble). The most commonly given wine clubs are two bottles delivered monthly for three or six months. Typically these are mixed red and white wine shipments, but if you know your recipient prefers one over the other, most wine clubs offer a red-only and a white-only option. As such, these are primarily the kinds of monthly wine clubs you'll find on our best wine club gifts list. There are, of course, exceptions. 1) Not all wine clubs can send wine to all 50 states, so it's important to check if they can ship where your recipient lives. We provide tools to help with that, but the wine clubs sometimes have different rules at checkout. 2) Wine club gifts tend to focus on "universal" preferences. If your recipient loves a particular grape or region, look for those wine clubs first. 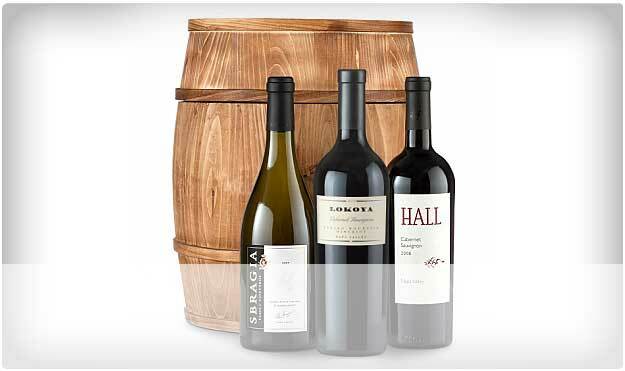 3) Three-month wine gifts typically run around $150 once shipping is factored in. There are usually discounts available around major gifting holidays in December, February, May, and June (we've got them all posted alongside their wine clubs and on the reviews). If $135 is too much for your budget, consider buying only one month or send a lovely one-time wine gift that offers exactly what your favorite wine lover wants. We bet you already know what we do... yep you guessed it, we review wine clubs. We do this to help wine-lovers find the best wine club for themselves or as a gift, all in the name of enjoying drinking wine on any budget. 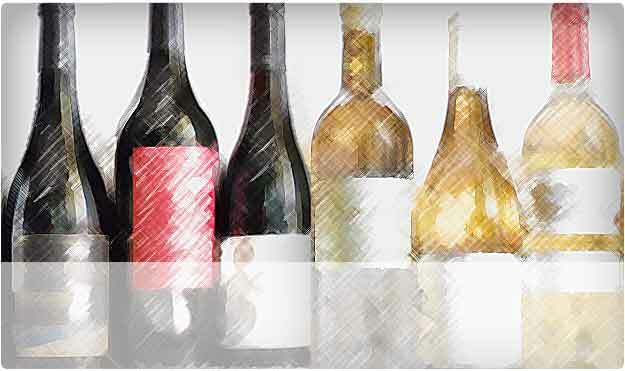 Check Out the Wines: We review the wines each wine club has sent in the past (as shown on their own website or, if needed, as requested via email). We verify awards and points, as well as size of production, and we evaluate Quality-to-Price Ratio (QPR). Whenever possible we receive shipments from the wine clubs to keep a trained eye on the quality, too. Scout the Deals: We look to see what kinds of discounts and perks the wine clubs offer their members. Some wine clubs have introductory offers or provide free-shipping so we want to know about that, too. Check for Customization: Many wine clubs offer great flexibility in the selection of wine color, frequency of shipping, and payment methods. We use this bend-over-backwards information to help us rate wine clubs. Read the Fine Print: We check all marketing copy, customer service information, FAQ pages, and return policies. When we find holes in the information, we contact the wine clubs to make sure we know what they will do for their customers and what they won’t.